Customized or personalized products. This includes private label, color selection of scented soy candles. 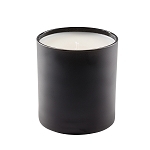 Private Label Candles are custom made to your specific choices, for that reason they can not be returned or exchanged for any reason. Please make sure you have sampled the fragrances that you are ordering, you can not return them if you decide you do not like the scent. If you are ordering clear glass soy wax can have what is called a wet spot. This is just the wax contracting away from the glass at an uneven rate. It does not always happen but can happen during shipping due to temperature and humidity changes. The candles are not defective and will burn correctly. Candles can not be returned because you do not like the look of wet spots if they happen to occur.